The tree stand was working to perfection—until the big buck turned off the old four-wheeler track the deer were using as a major travelway and headed directly at me. 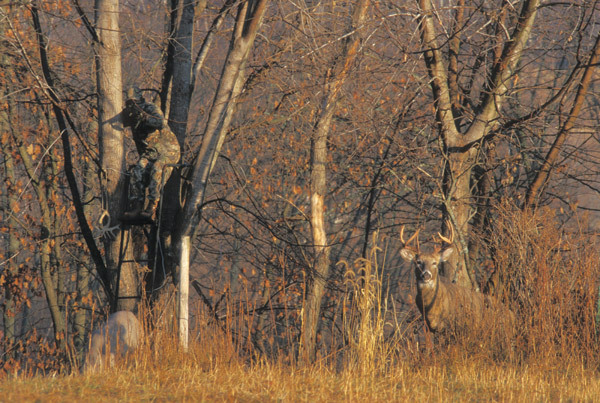 Whitetails, especially mature bucks, are notably unpredictable. In this case, however, I had inadvertently created the problem. Earlier that fall, I’d used a weed-eater to clear the pathway the deer was now following. I’d done it to facilitate a quiet, scent-free approach to the base of the tree where I planned to hang the stand. I avoid crossing deer trails to get into stand or blind locations, but in this case, it had been unavoidable. Then, to try to make the best of the situation, just before starting in on the cleared trail I had given my rubber boots a liberal application of deer scent, hoping the scent trail I’d leave behind would divert any curious deer and hopefully bring them toward my ambush. Good idea. But the 140-class buck now following that scent trail presented only a steeply angled frontal shot as it approached and then a straight-down shot when it finally stopped where the trail ended—right at the base of the tree that held my stand. The deer paused and looked about for a few seconds. Then it turned and headed straight back up the pathway, never presenting a decent bow shot. When the buck hit the main trail again, it headed back the way it had come. Mistake No. 1: I should have continued cutting the path past the stand a few yards out, so that the curious deer following the trail would have passed in front of the stand and presented a broadside shot. Mistake No. 2: Applying deer scent to the boots was a good idea. However, I should have used a scent-soaked drag rag, and I should have followed the trail beyond the stand before cutting sharply back to the tree. Any deer following those footsteps also would have presented a short-range broadside shot. I almost certainly could have taken that buck with any legal firearm. But a bowhunter must be more precise in his plan of attack if he wants to put deer in position for a clean shot. One of our shotgun-toting hunters tagged a nice 10-point out of that very stand. Even though it was later in the season and the rut was over, he used a doe-scented drag rag to lead that buck right to its demise. Starting during spring turkey season, and picking up again in late summer and early fall, I look for places where I might alter the cover on our hunting leases to maneuver deer into position for a better shot, and I do this primarily by creating easy pathways for the deer. Deer generally take the path of least resistance and quickly become habituated to easier travelways. Several years ago, I hunted a Missouri farm that included a chunk of CRP set-aside acres that had become choked with head-high weeds and grass. The dense cover was bordered on one side by an even denser jungle of willows, vines and brush that followed a winding creek bottom. The upper side was bordered by a long, narrow food plot and then a strip of thick timber. A hunter sitting on either end of that CRP field would have had a tough time seeing deer crossing through the high grass and weeds. The only place the deer were readily visible was in the narrow food plot. But, the plot hadn’t done well that year, and the cautious deer didn’t lollygag around in the open space. The obvious solution was to hang an elevated stand halfway down the strip of timber above the food plot, and we put a 15-foot ladder stand against a big cottonwood at the edge of the wood line where there was plenty of background cover. From that elevated stand, a gun hunter could now cover the entire food plot and CRP field. However, a bowhunter’s chances were pretty much limited to a single deer trail that entered the food plot about 20 yards out from the stand. To make the stand more effective for bow hunting, I used a weed-eater to widen this path through the head-high CRP grass, following the existing deer trail from the food plot all the way down to the bottom thickets below. Every time I sat that stand during bow season, deer passed within shooting range, and almost all were following the enhanced trail. Often as not, all it takes to get a deer to go where you want is a little planning and the judicious use of a weed-eater. 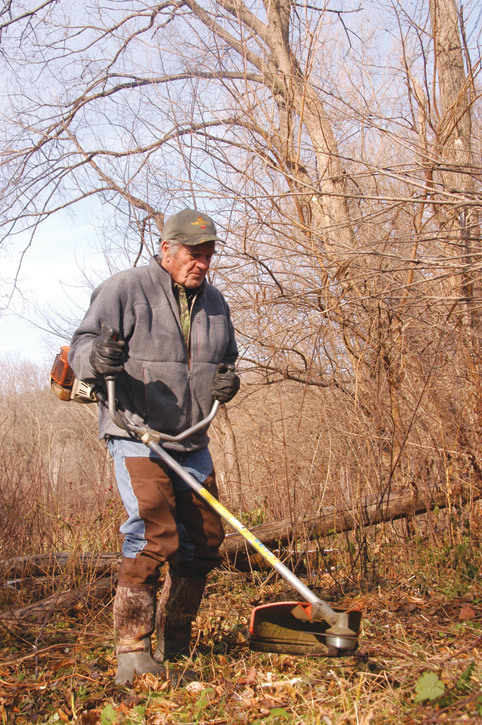 But when it looks like that isn’t going to be enough, I may also cut brush and limbs and use them to block trails or crossings that might lead the deer away from a carefully located tree stand or ground blind. On one of my leases, the farmer cut the timber along a creek bottom adjacent to a cornfield and then ’dozed the brush and debris into windrows at the edge of the field. In the process, he blocked off some well-used deer trails that we had been hunting and also created a number of new deer crossings. We got in there with chain saws and filled in most of the new passageways, reducing the number of open trails from a dozen to just two. Then, to make these two trails even more appealing, we sprayed Roundup to prevent the brush growing back up and obscuring the obvious travelways. My clients have been taking good bucks on or adjacent to those trails for three seasons now, making the effort more than worthwhile. I would say 90 percent of the deer that cross that quarter-mile strip during hunting season use one of those trails or the other. Altering cover to redirect deer traffic doesn’t require much in the way of equipment. All it really takes is a little scouting, thought and ingenuity. A hand saw, weed-eater or lawn mower, and a spray bottle of Roundup will accomplish all but the most ambitious projects. Sometimes directing deer movement can be as simple as “brushing up” the fence crossings on either side of a stand and then using baling twine to tie down the top wires of the fence where you do want the deer to cross. It won’t be long before the deer start taking the easier crossing—leaping right to where you want them. A narrow neck of woods on another of our leases has been used as a year-round travelway by generations of deer. There are open crop fields on both sides, and the deer prefer the protection of the dense woods and brush, especially during the first few days of gun season when outlying hunting pressure pushes them onto the protected leases. When I first scouted that 100-yard-wide strip of woods, I knew I had found a special place, and with a little work, I figured I could make the natural funneling effect work even better for a couple of well-positioned bow stands. The first thing I did (with the farmer’s permission) was treat the woods with 300 pounds of 19-19-19 fertilizer to produce even heavier ground cover. Then, my guides and I cut downed timber and brush to block all but the most obvious deer trail right in the middle of the strip. We’ve taken some dandy bucks there. Of course, my clients still report seeing bucks crossing the open fields on either side of the wooded strip. Whitetails don’t always do what’s expected. Wouldn’t be hunting, otherwise. A couple of seasons back on another lease, I found a deep hole in a creek that held water long after the rest of the creek quit running in the fall. The deer just hammered that waterhole, and there were well-established trails coming in from every direction. But there was only one really good location for a tree stand for bow hunting, so I brushed up the bottom above, below and behind the waterhole, guiding the deer to move around and approach only from the desired direction. Two weeks later, I put one of my clients in that stand. Over the next three days, he reported seeing 30 deer pass within bow range, including a 150-class buck he arrowed at 15 yards on the third day. Unfortunately, the past few summers in Iowa haven’t produced enough rain to keep that waterhole filled. Still haven’t figured out a way to change the weather and improve the deer hunting—but I’m working on it.